I recall the Seoul branch as being at a similar level as NYC but with the food tilted more Korean. I recall the lists at Mingles and at Jungsik being at least "ok". I had a 2014 A. et P. de Villaine Rully Les Saints-Jacques for 99k won at Mingles and a 2012 Wieninger Pinot Noir Select for 78k won at Jungsik. Good food, too, at both places. The guy who runs this operation lives in NW DC, I believe. I am not a fan of Spike Gjerde or his restaurants such as Woodberry. They have always been very twee and pretentious. Peter's Inn is a quintessential Bmore place. I had the '99 18 months ago. Pretty good but didn't ring any bells. Thought it needed more fruit. Sorry my rec let you down. Did you at least check out their wine cellar and get a cool bottle? Topic: one dinner in Arlington or D.C.? Re: one dinner in Arlington or D.C.? My one meal at Centrolina was, perhaps unfairly, burdened by comparisons to recent meals in Italy. It is the type of restaurant that DC does - a fancified simulacra of the real thing! Topic: Mexico City... cheap eats? Re: Mexico City... cheap eats? Tetsuan is pretty awesome kappo in Tokyo. Nero d'Avola was not bad, though the wine list was only ok. Tiramisu was awesome though! If you want you can find some details on search. Cave Ox also has good wine and tasty casual food - it may or may not be close to Taormina for you. If you like art, the Rufino Tamayo museum near the anthropology museum is a small gem. Do any of you with 4-digit CFM hoods have powered make-up air systems (as opposed to a passive "hole" in your house)? If so, what sort of person designed it? Several years ago I enjoyed dinner at Alte Pfarrey in Neuleiningen. I think they serve lunch, too. 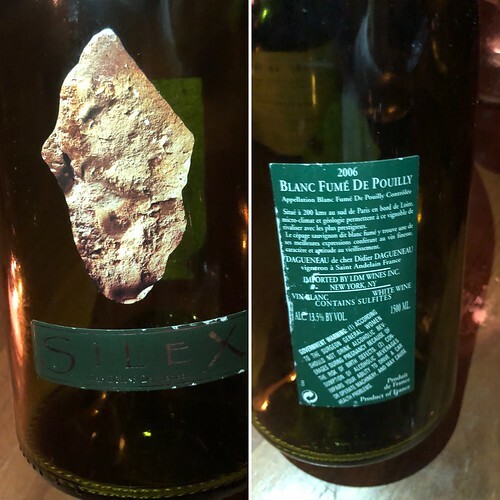 I opened the 2006 Silex last night in magnum. Didier's last vintage. I don't think anyone makes a sauvignon blanc similarly. '07 was not his last vintage? Are you going to Kentuck Knob? It was an interesting counterpoint to Falling Water. Recently had good (not great) seafood at Fishers in the City and some quite nice drinks of Knockando at Thomson's Bar. Morgan Library is pretty cool and I think their current exhibitions are fascinating. i've enjoyed Elevage a lot. Why'd they move? Sicily was amazing if you like history, friendly people, great food and wine, and beautiful scenery. Had an amazing meal there a few years ago, too. Then the next day, on a holiday weekend, the somm got us in to a fully booked Elkano. 2 Amy's then a short walk to the National Cathedral. +1000 on Kew Gardens. Just there today and it was amazing. A Rake's Progress and the Dabney purport to serve regional cuisine. Quarterdeck is the best crabhouse I know of in the close surrounding area. Whaley's and several Hank's Oyster bars have decent seafood in a non-shack ambience. It was a few years ago that I visited but Laurie Raphael was not worthwhile. However, http://www.clocherpenche.ca/en/ was quite good, and recommended here on an old thread. Topic: Wash D.C. and Pittsburgh restaurant reccos?? Wash D.C. and Pittsburgh restaurant reccos?? Salt Lake City Dinner Recs? Copper Onion seems a bit tired compared to he past (and sounds like the same for Pago!). Stomeground Kitchen was pretty tasty pasta, pizza, and charcuterie. I think all Lufthansa lines have this same 5L restriction. Thinking about upgrading to a Bluestar range but I worry about the gas oven. How much worse is a gas oven than electric? Worse enough that I should upgrade even further to the dual-fuel Capital unit Kenny has? Did you get Contramar's whole grilled robalo? I have had but few better whole fish dishes in my life.